Glass and metal containers I store food in. Endocrine disruptors are chemicals that interfere with normal endocrine function. These chemicals are common and cause negative effects on reproduction, physical and neurological development, metabolism, fertility and thyroid function. They are found in our foods, in the flame-retardants coating our beds, couches and clothes, in our cleaning and personal care products and in packaging our food comes it. BPA or bisphenol A, phalates, organophosphates, atrazine, perchlorate and arsenic are just some of the endocrine disruptors found in our food, food containers and water. These chemicals can effect both children and adults. While it is difficult to replace our couches and beds, there are some simple ways to reduce our exposure to these potentially harmfully chemicals. BPA is a chemical used in thousands of products including the epoxy linings of most food cans, plastic containers marked pc or with the recycling label #7 on it, plastic water bottles and food containers, microwave ovenware and cooking utensils. According to the Breast Cancer Fund, BPA has been correlated with cardiovascular disease, breast and prostate cancer, reproductive dysfunction, metabolic dysfunction and diabetes, and neurological and behavioral disorders (FAQ: BPA and Alternatives, (n.d.). BPA is a fat seeking chemical and can leach from the container into foods especially when it is heated like washed in the dishwasher or used in a microwave oven. 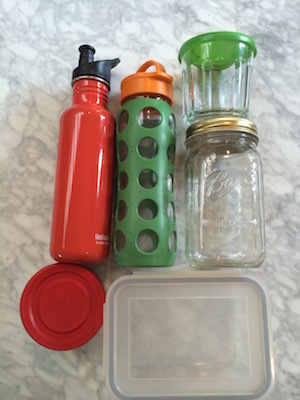 Tetra and glass packaging are good alternatives to BPA. Some plastic products tout health claims about being BPA free, but little is known about their chemical composition and more research needs to be done before they can be considered safe. Phalates, another endocrine disruptor, are found in plastic containers, soft containers and plastic wrap made from PVC, which has the recycling label #3 on it, and a host of other products (Environmental Working Group, 2013). Phalates are absorbed through the skin. Recently, they were been banned in children’s toys, but still are found in cosmetics, some pharmaceuticals and many other products. The best way to avoid them is to avoid eating out of soft plastic containers and to check the labels of fragranced cosmetics. Perfluorochemicals or PFCS are used in nonstick cookware and are another kind of endocrine disrupter. Avoid using nonstick cookware that has been scratched or is pealing. A well-seasoned cast iron pan or a porcelain lined pan, such as those by ScanPan are good alternatives. Atrazine, perchlorate, lead and arsenic are all endocrine disruptors found in water. The easiest ways to avoid these is to drink filtered water and not out of plastic cups. We are just starting to understand that these and other toxic chemicals affect our health. The Environmental Protection Agency (EPA) has required safety testing for just 200 of the 80,000 chemicals used in this country and only five of those chemicals have been banned or restricted (Reform the Toxic Substances Control Act, n.d.). Interestingly, we have very little information about how these chemicals act when they are mixed together or with other chemicals. For more information about toxins and how to avoid them, check out Breast Cancer Fund, Environmental Working Group, Pesticide Action Network and Natural Resource Defense Council, which are all good sources of consumer information for understanding, avoiding and advocating against the use of endocrine disrupting chemicals.